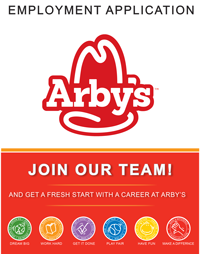 If you are looking for an opportunity to be part of our team, stop by any of our convenient locations and fill out an application or send us an email at arbyssppringfield@sbcglobal.net. A member of our staff will respond to your inquiry as soon as possible. It doesn't matter if you want to become part of our management team or a part-time crewmember for the summer; we are always looking for outstanding people. Come aboard and help us get the Springfield, Mo community saying, "Arby's is slicing up freshness". Click the picture below for a printable application.